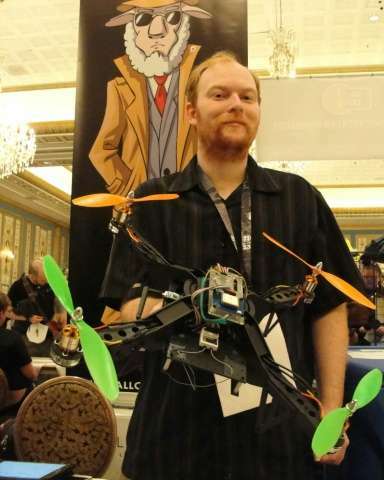 David Jordan of US-based Aerial Assault was at an infamous Def Con hacker gathering on Sunday, showing off a drone that could be dispatched on missions to land atop buildings or hover outside walls and probe for cracks in computer networks. "There has never been this capability before," Jordan said as he showed the drone to AFP. The drone was equipped with software tools used to perform the kind of "penetration testing" done by hackers or computer security professionals who seek vulnerabilities in computer networks. As with drones previously launched by hackers, the Aerial Assault model scans for unsecured wireless connections to networks, according to Jordan. Along with assessing weaknesses of networks, the drone logs precise GPS coordinates of a target and takes all the information back to its handler, he said. Aerial Assault drones were for sale, at a price of $2,500 each. 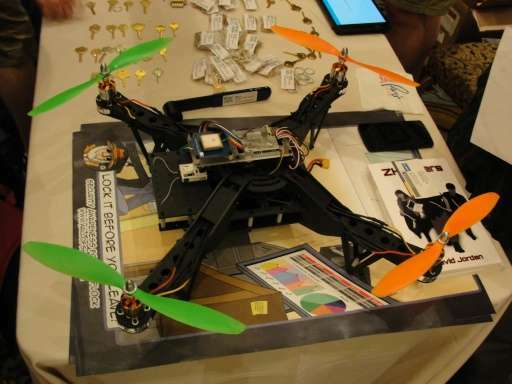 Hackers at Def Con early on turned to drones for sniffing out unprotected wireless Internet networks, but capabilities Jordan said were built into the Aerial Assault drone raised the ante with automated tools that could be flown past physical defenses.